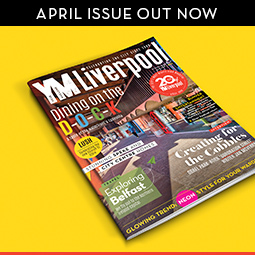 Here in the Liverpool City Region though, we can see it’s a place on the up – kick-started in part by ambitious plans for a world-class tourist attraction. It’s been over two and half years since bold plans were submitted for a 350-seat theatre in the heart of Prescot, just metres from the site where an Elizabethan playhouse once stood. Some believe William Shakespeare – seeking shelter from the Great Plague in London – spent time at Knowsley Hall, and whilst there oversaw the production of some of his earlier works. 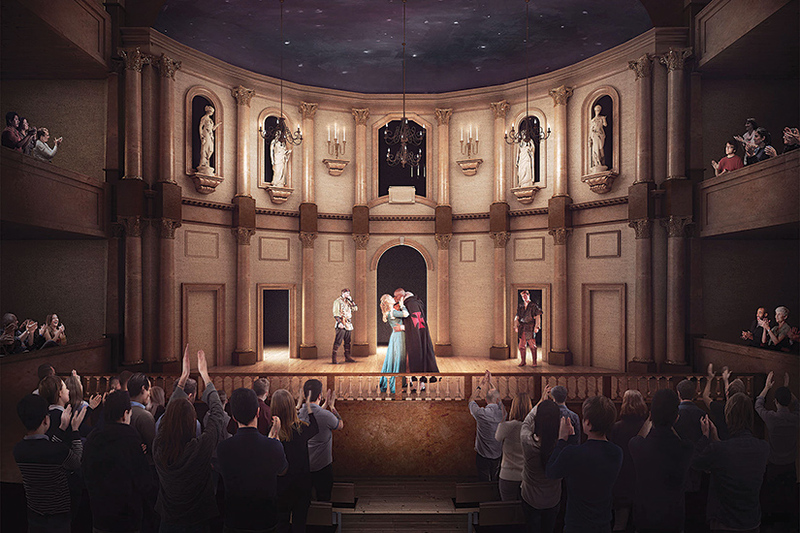 Fast forward to today and the Shakespeare North Playhouse, built to designs first drawn up in 1629, is slowly edging its way towards reality. Featuring a performance studio, education centre, coffee shop and office space, it’s hoped the £19 million attraction will draw more than 100,000 visitors a year from the UK and across the world. Construction work will get underway in the autumn and is expected to reach completion by the summer of 2020, but its positive impact is already being felt across the town. Just a short walk from Prospero Place, the address of the new playhouse, a £500,000 transformation is currently underway of an unused public square on Market Place. Husband and wife duo Francesco and Gaynor La Rocca, who have been chosen to run new café and community facility MATE Cafe Bistro at the redeveloped site, are planning a wide range of events including comedy, poetry and film nights, an open-air cinema, and pop-up performances. Move over Bold Street…Prescot is planning an assault on your spot as Merseyside’s premier restaurant retreat with a string of exciting openings in the pipeline. First up we’ve got Balearic bar and charcuterie Urbano Chiringuito. Inspired by Spanish beach bars and offering a range of authentic drinks and sharing boards, the new venue is the brainchild of local couple Clare Wilson and Peter Stewart. The pair fell in love with the chilled out vibes and relaxed Balearic beats of the Ibizan small enterprises whilst on holiday and thought it would be a great idea to bring something similar back home. Clare and Peter, who say the current buzz around Prescot is “brilliant”, are looking to launch their new concept in the autumn. Meanwhile on the corner of Market Place, work is well underway to transform the old Red Lion pub into Kingsmen 1685. Details are thin on the ground but we’re being told to expect food influenced by street food cooking traditions based on “time honoured recipes from around the world”. Next up it’s in vogue restaurateur Gary Usher and his new bistro, Pinion. The man behind acclaimed Liverpool eatery Wreckfish raised £50,000 in just 24 hours for his first Knowsley venture. Pinion’s menu will feature freshly baked bread and humble bistro dishes, such as a beef braise with truffle and parmesan chips and a classic tart for dessert. “Prescot has an amazing sense of community with people who are so proud of where they come from,” Gary tells YM Liverpool. With many fans becoming increasingly disillusioned with England’s top division, recent years have seen a surge in support for non-league football clubs across the country. And in Prescot, home to Knowsley’s most senior football team with a history which stretches back more than 130 years, the story is no different. Run as a Community Interest Company (CIC) since 2009 (fans can purchase a share in the club for £5), crowds at Prescot Cables FC were increasing even when the club was struggling against relegation. Whether it’s the liquid football on show or the liquid refreshment provided by the nearby Bard pub which keeps the turnstile turning, it’s clear Prescotians are enjoying cheering on their Pesky Bulls. “Prescot Cables is doing well because it has tapped into the independent spirit that seems so prevalent within the town,” says Gareth Coates, programme editor at the Valerie Park club. Gareth, who hails from down south, has become as much a fan of the football as he has the town since he got involved with Cables last year. “It only took one visit to fall in love with not just the club, but the town. It retains a sense of history, but it’s continuing to evolve,” he adds. Over on Leyland Street, a stone’s throw from Prescot Shopping Centre, is a business which maybe more than any other exemplifies the town’s renascent air. 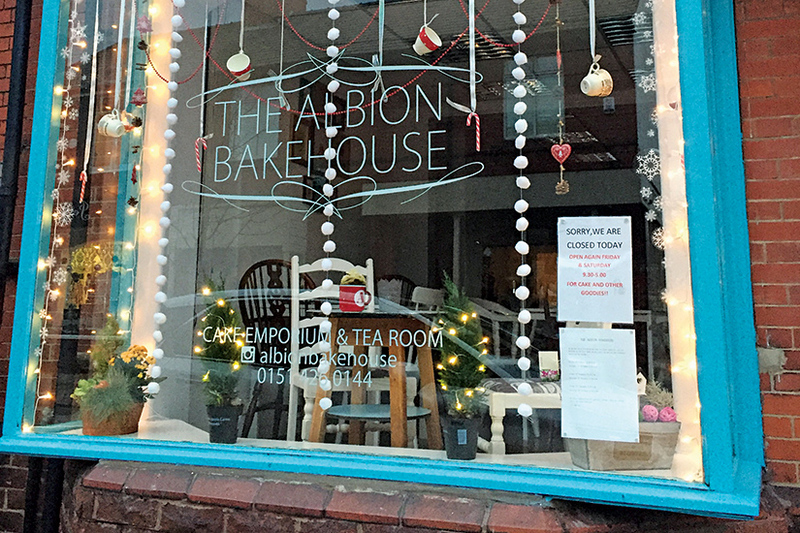 Local resident Nina Halliwell started tearoom and cake shop Albion Bakehouse in 2015 after building up a buzz for her decadent desserts at producer markets and food festivals. Not long after opening, Nina realised the terraced shop didn’t quite come up to scratch size-wise, and was having to regularly turn people away who wanted to sit in. Down in Albion is her answer. 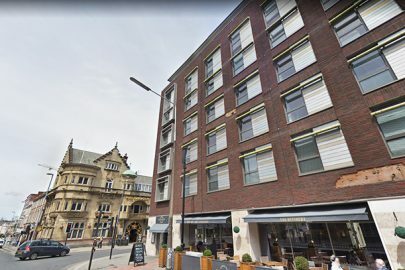 Situated just around the corner on Atherton Street, the new venue will be a place for breakfast, brunch, lunch, afternoon tea, and eventually offer evening meals and alcohol too. “We have lots of loyal customers and people come from all over Merseyside to visit us,” says Nina, who’s running an online Kickstarter campaign to help fund the venture. “Prescot is a great place to live. I love the sense of community and especially now as people can see it coming back to life with so much interest from outside investors. “People are really starting to rally round and help make Prescot a destination. Trains into Liverpool city centre run every half an hour from Prescot station on Bridge Road. The average journey time to Lime Street is just 23 minutes. As an added bonus for commuters, the adjoining former stationmaster’s house has been repurposed as a coffee house offering fresh brews and an extensive food menu. 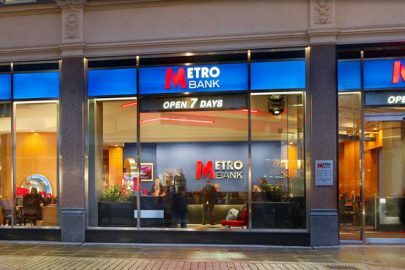 For trips to Liverpool, Manchester and elsewhere, the M57 is a short drive down Liverpool Road, linking up with the M62 at Tarbock Island. Prescot enjoys a varied mix of housing, catering for families and couples alike with a wide section of detached, semi-detached and terraced properties available. A smart one-bedroom flat in a centrally located converted church will set you back just £60,000, whilst a four-bedroom detached new build at Rosaline Gardens is up for £219,995. According to Rightmove, most property sales in the town involved semi-detached homes last year, with the average price of a house coming in at £144,869.